With all this wonderful spring weather we have received with day time temperatures in the forties and night time temperatures in the twenties, this year sugaring season has been quite bountiful. We hope to continue to provide customers with maple syrup throughout the summer at our Farmer's Markets in South Hero and Grand Isle. 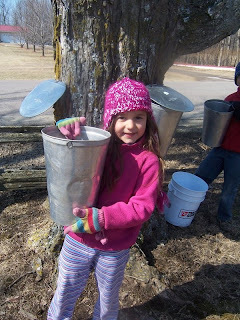 Each day the children help collect the sap the old fashion way by removing the buckets from the trees and pouring the cold sap into a storage tank. The storage tank is pulled by a tractor that visits each tapped tree before coming back to our simple sugar shack. It is then put into the evaporator and boiled for many, many hours before it is turned into delicious maple syrup.